The Rusty Spur trail is in the Moab Brands Mountain Biking Area north of Moab, Utah. The trail makes a loop around a colorful open area where the red dirt provides a brilliant background to the sparse desert flora. With the similar colored cliffs as a backdrop and topped by the deep azure sky the setting is a pleasing delight to the senses. This post begins at the south trailhead of the Moab Brands area. To get there drive between 8 and 9 miles north of Moab and turn east at the Moab Brands sign across from the Gemini Bridges staging area. Follow the dirt road past the Bar M Chuckwagon and continue straight past the turnoff to the BLM trailhead along the now narrower gravel road to the trailhead. 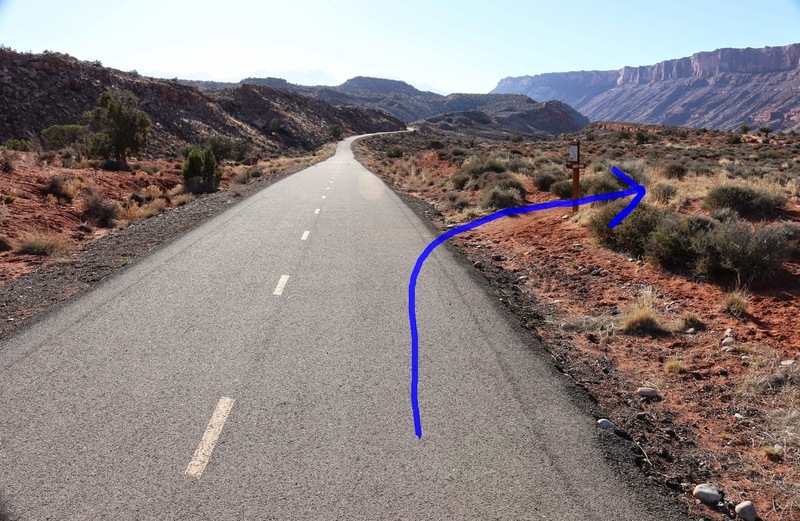 Of course, you can also park at the BLM trailhead where there is a restroom and ride the pipeline road or another trail to get to the Rusty Spur. Follow the Moab Canyon paved path back toward town from the trailhead and watch for the beginning of the Rusty Spur trail after about a tenth of a mile. The Moab Brands trails are well marked and most intersections include a locater map. As the trail heads south along the rim of the hill it comes to a short spur that connects it with the Sidewinder trail. If you like jumps get your speed up for the first of two cattleguard crossings. The trail begins looping back as it approaches the end of the hill above Deadman's Curve. As the trail heads back toward the north there is a slight uphill grade with a few washes to meander around. For the last stretch the Rusty Spur follows the pipeline road until it reaches the paved path. Across the path you can continue following the pipeline road for 8 tenths of a mile to the main trailhead or take the Rusty Spur spur trail over to the EZ trail. For this post we simply followed the paved path back to the south trailhead. There isn't a lot of room for vehicles around the south trailhead but if you do park there it provides closer access to the Rusty Spur, Sidewinder, Escape, Deadman's Ridge, Long Branch and Killer B trails. And the Bar M Loop passes right through it which will get you pretty much anywhere else you want to go in the Moab Brands area. The Rusty Spur is a good beginner trail and a nice one for anyone else that is wanting to take a break from some of the more demanding trails at Moab Brands. If you would like to see it for yourself then all you have to do is 'Take a hike'.